Texans linebackers coach Mike Vrabel turned down an offer from Chip Kelly in the offseason to become the San Francisco 49ers defensive coordinator. The rope was burning up football players' callused hands as an old-fashioned tug of war unfolded at dawn during a spirited conditioning drill at Ohio State five years ago. The fierce competition between the Buckeyes' offense and defense set off a battle of wills between two of the rising coaching stars in the industry. As the offense won the drill with a mighty final pull, it was met by a celebration and some words from future University of Houston coach Tom Herman. That reaction triggered a brief confrontation between the Buckeyes' offensive coordinator and then-Ohio State defensive line coach Mike Vrabel, an imposing former New England Patriots Pro Bowl outside linebacker. Neither man would back down. And the 6-4, 261-pound Vrabel towered over Herman, a much smaller former Cal Lutheran wide receiver. "Mike's an intense dude, that's for sure," Herman said. "We had only been coaching together for not even a month and we're in a mat drill, a tug of war at 6 a.m., and Mike was talking smack. Long story short, I find myself nose to nose with Mike Vrabel trying to pick a fight with him. "Needless to say, it was not a very wise decision on my part. He definitely spared me with his mercy and allowed people to hold us back before he got the better of me. He could have killed me and he didn't. I'm forever grateful." Years after the clash with Herman, Vrabel smiled this week while recalling the altercation with one of his best friends in the profession. "There were some choice words Tom and I shared with each other," Vrabel said. "It was early morning conditioning - new staff, new team. Everybody was on edge, and the offense beat the defense and Tom might have gotten in one of the player's faces that lost, and I quickly got over and might have pushed him away. But Tom and I are great friends, and he's done a great job in Houston. We're happy he's here." The Texans have a similar feeling about the continued presence of Vrabel on their coaching staff. One of the most pivotal moves of the Texans' offseason by general manager Rick Smith and coach Bill O'Brien was collaborating with owner Bob McNair to convince Vrabel to stay with the AFC South champions. Vrabel declined an offer from Chip Kelly to become the San Francisco 49ers' defensive coordinator after interviewing for the job, landing a hefty raise from the Texans for resisting the overture. There will undoubtedly be other future opportunities for the 40-year-old to run a defense. Vrabel is learning behind 68-year-old coordinator Romeo Crennel, one of the most experienced and highest-compensated defensive coordinators in the game. There are scenarios in which Vrabel eventually could succeed Crennel down the road or emerge as a future NFL head coach. "The sky's the limit for Mike, he's a natural," Herman said. "We're watching the career of a head coach in the NFL unfold right before our eyes. When that happens and when the right time is, nobody knows. If I was a betting man, I would surely bet he will be a head coach in that league before too long." Herman is admittedly not impartial when it comes to Vrabel, but what he's saying carries legitimacy and is being echoed in NFL circles. Vrabel is regarded as a tough, passionate coach who relates well to his players. The former Patriots standout has a demanding style but also communicates well. "Vrabel has that 'it' factor you can't teach," an NFL executive told the Chronicle on condition of anonymity. "You can see that what he was like as a player - a tough, smart, determined guy - translates very well to what he does now as a coach. He's a huge part of what the Texans are doing on defense. I can tell you that he's on a short list with a bunch of teams as a defensive coordinator candidate. "He's such a good leader that I could also see him skipping a step and being a head coach without going the coordinator route. You can see why the Texans stepped up to keep him." Vrabel was instrumental in the development of outside linebacker Whitney Mercilus last season. Mercilus recorded a career-high 12 sacks in the regular season and notched three more in an AFC wild-card playoff loss to the Kansas City Chiefs. Under Vrabel's direction, middle linebacker Brian Cushing had his most productive season in years and led the team in tackles. Rookie inside linebacker Benardrick McKinney became an effective starter. And outside linebackers John Simon and oft-injured former top overall pick Jadeveon Clowney combined for 91/2 sacks. Although the 49ers made Vrabel their first choice and offered him the job, he felt his top option was staying in place with the Texans. "Being a young coach in this profession and in this league, it's always great to have people want to interview you for opportunities," Vrabel said. "In the end, what's best for us and me is being here." Vrabel earned three Super Bowl rings with the Patriots. The hard-nosed Akron, Ohio, native recorded 704 career tackles, 57 sacks, 11 interceptions and forced 17 fumbles. He doubled as a red-zone target for Patriots quarterback Tom Brady as a tight end, catching 10 touchdowns on 10 career receptions. 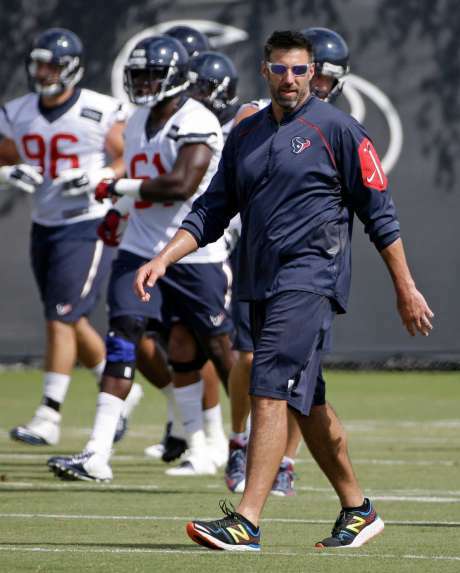 Now, Vrabel is imparting his knowledge and passion from his 14 years playing in the league as he enters his third season coaching for the Texans and his sixth year coaching since retiring following the 2010 season with the Chiefs. "I think you're always learning and trying to study the game and trying to understand schemes and concepts," Vrabel said. "The biggest thing in coaching is being able to reach your players. The schemes can be great. The concepts can be great, but until you make that connection with your players and get them to believe they're getting better and they can see they're getting better and you're giving them ownership of the room and having conversations and dialogues. "That's been the biggest thing for me as a coach is trying to make a connection with the players. Once you can set the hook, you got their attention." Collaborating with Mercilus last season, Vrabel helped the fellow Akron native hone his techniques and become a more impactful contributor as a bookend pass rusher opposite Pro Bowl end J.J. Watt. It allowed the defense to become more dangerous and versatile. "Oh yeah, our relationship has grown," Mercilus said. "Him being here, it's grown tremendously. He wants nothing but the best for us, and that's exactly that. He loves it when the players go out there and just perform well." Beyond the strategy aspect of football, though, what resonates about Vrabel is his hard-nosed approach to the game. He has a leadership style and a tough-love style that gets players to buy in and play hard for him. "He's an unbelievably passionate guy, not just for the game but for his player," Herman said. "He's one of the truly genuine guys in our profession that really cares for his players. That shined through in how hard they played for him. His knowledge of the game is off the charts having played as long as he has and studied the game. He's one of the great ones for sure. "The coaching part for him was easy. For lack of a better term, he's been a coach on the field for most of his career." A former consensus All-American at Ohio State who was named to the Buckeyes' All-Century team, Vrabel tends to have an encouraging approach to coaching. He's also quick to remind his players about how poorly the defense played in blowout road losses to the Atlanta Falcons and Miami Dolphins during a 2-5 start last season before finishing third in total defense and first in third-down defense. "We've talked about that in the linebacker room about we don't want to rely on the reputation of a team that was third in defense," Vrabel said. "That doesn't mean anything. What we need to do is remember how we played on the road in Atlanta and on the road in Miami and try to fix those things and not let them happen again. We can't rely on our reputation as defensive football players." When Vrabel was playing for the Patriots, he embodied what coach Bill Belichick was seeking in players in terms of not taking anything for granted and possessing an ability to adapt to any situation. Those qualities are serving the Texans in a similar manner in his role as an assistant coach whose importance has increased each year since being hired by O'Brien. Vrabel wants to keep growing as a coach. "I think that's just kind of in your nature," Vrabel said. "That's what you believe in. Either you have it or you don't. "There are days where you don't feel great and you have to work as a player and a coach and compete and grind and make your players better. You have to earn your position in this league every day."